17 June 2016, Rome – Improved land management strategies and technologies being used across sub-Saharan Africa are helping protect the environment, boost agricultural productivity, strengthen livelihoods and enhance food security, according to a new study. The document – published by the New Partnership for Africa’s Development (NEPAD) and its TerrAfrica partners, including FAO, takes stock of lessons learned during the five-year TerrAfrica Strategic Investment Program (SIP) for sustainable land management. TerrAfrica is an African-driven global partnership program to scale up sustainable land and water management across sub-Saharan Africa. Its SIP initiative – which ran from 2010 through 2015 – provided $150 million of land degradation funding from the Global Environment Facility (GEF) and attracted co-financing of $800 million to support 36 projects in 26 countries. Working across a diverse range of farming systems, SIP support focused on scaling-up proven practices, strengthening advisory services, and improving policy frameworks and knowledge management. It resulted in sustainable land management practices being implemented on 2.7 million hectares, benefitting some 4.8 million people. Everyday life scenes of a pastoralist family – women collect water in Tera, Bajirga, Niger. “This initiative provides an opportunity for Africa and its partners to collectively work together toward ensuring the sustainable use and management of land,” said Dr. Ibrahim Mayaki, CEO of the NEPAD Agency. 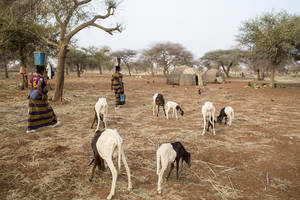 “These findings are particularly relevant to us today, as we mark the World Day to Combat Desertification,” said Sally Bunning FAO Senior Land resources officer. “This report confirms that there is a vast and diverse suite of tools that can successfully be used, in diverse farming systems and in different contexts, to improve land management. It also underscores the importance of investing in longer term and wider scale efforts and in knowledge sharing for sustainable societal benefits” she added.